While working at Tactica Interactive I was involved in creating an interactive touchscreen wall for Travel Manitoba's Visitor Information Centre at The Forks in Winnipeg. 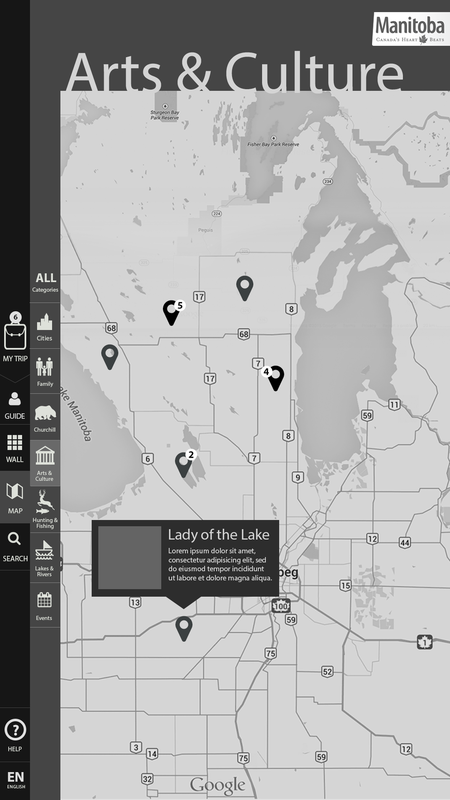 The Interactive Feature Wall takes visitors on a digital journey across Manitoba, providing the tools and inspiration for travellers to make their trip a reality. The constraints on this project were mostly coming from the hardware. The client had already decided they were going to position the screens in portrait mode with their architects. This was troubling as vertically positioned large screen could represent a problem when it comes to accessibility. Most of the UI was based on trying to make every actionable area accessible to the users. For optimised reachability the content area is scrollable by the user allowing access to any type of content in the main area. Additionally, positioning the navigation in the middle of the screen placed it within the reach of most people standing or sitting. When the screen has not been used for 15 minutes a standby screen with the branding and photography of the province. When the user engages the screen they have the choice to browse or to customise their selection by answering a few questions. The wall is composed of card tiles sized by importance. 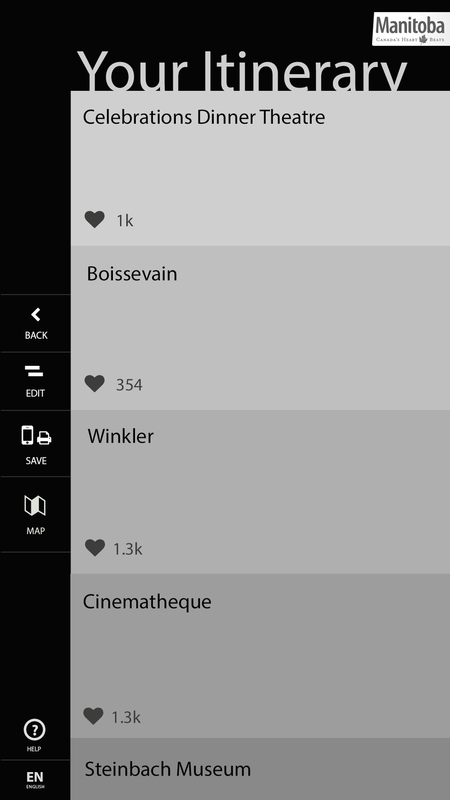 The user can adjust the listing by category in the menu located on the left. To dive into the wall the user just has to scroll using standard multitouch gestures. The map lists the same selection as on the wall however only displays it when in view. Each card expands into a page with more information depending on the content type. One of the main objectives is to get the user interested enough so that they add the item to their own itinerary. Users can search for specific items. 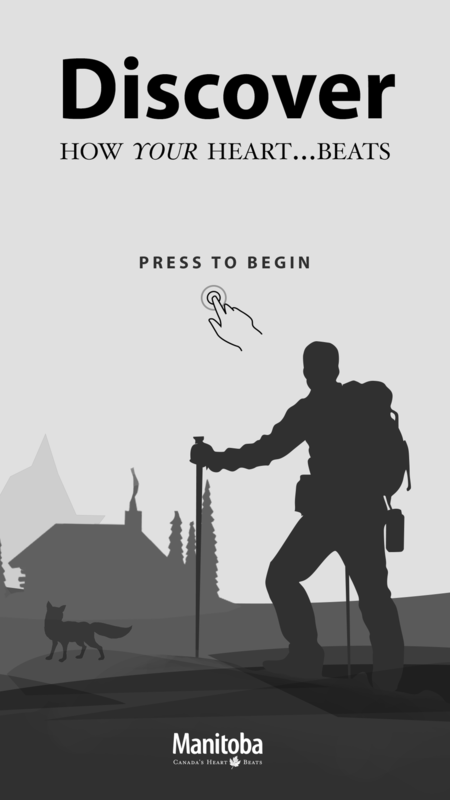 For input a touch keyboard is presented around the middle of the screen, where most hands most likely will reach. 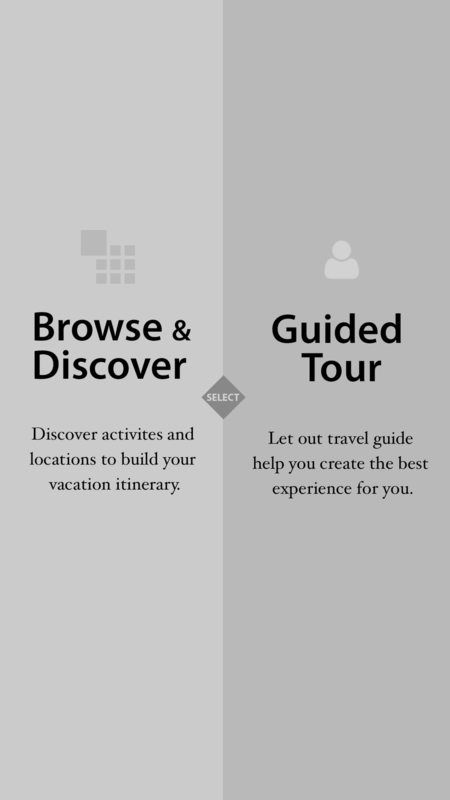 The main idea behind the trip planner is that it allows the user to create their own list of items they are interested in. After the list creation a URL is generated where the user can go and see their itinerary online. If a hard copy is preferred then that could be arranged as well. 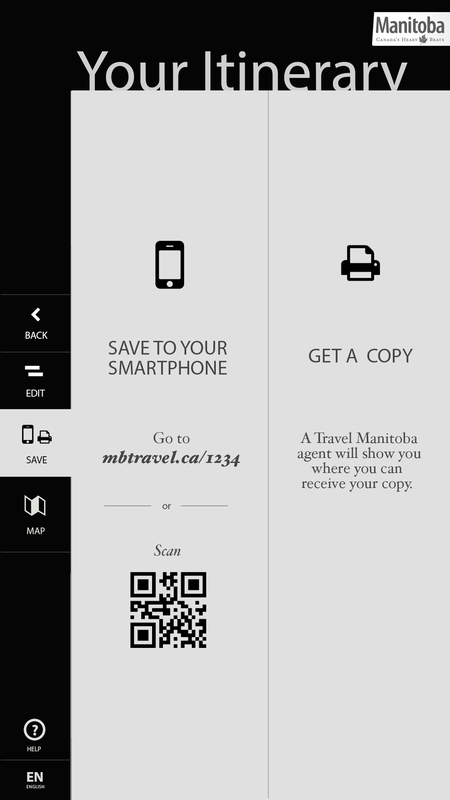 Through a QR scan the user is automatically taken to their corresponding itinerary from where they can email it to themselves in a PDF format or share with friends.